› Outlook › Configure and Maintain › Missing Outlook data files after upgrading Windows? The good news: In all likelihood, the data files aren't really missing. When Windows upgrades your computer, it creates a folder called "windows.old" and it contains all of the files used by the previous Windows installation, including your user account files. Windows 10 does a better job at migrating your files when a major update is installed and the folders in Windows.old may be empty. To recover your data files (and other personal files) open Windows Explorer and go to C:\Windows.old\Users\username\AppData\Local\Microsoft\Outlook Your old data files should be there, or in the Outlook Files folder in My Documents (the old My Documents!). Move the files to their proper location. Do not access them from the windows.old folder. They may be deleted when Windows cleans up the disk or another update is installed. *.pst files should be moved to your Documents folder. Outlook now uses Documents\Outlook Files as the default location for pst files. 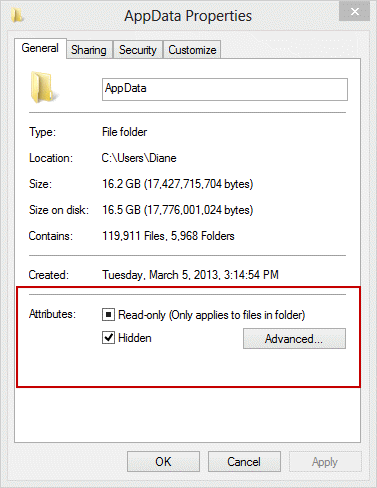 Because the folders under the AppData folder are usually marked Hidden, you may need to configure Windows Explorer to display hidden files and folders or remove the read only (and Hidden) flag from the properties of the AppData folder and apply it to all child folders. To show Hidden files and folders in Windows, switch to the View tab in Windows Explorer. The option is on the right. Clear the boxes and click Apply. Choose Apply changes to folder, subfolders and files then click OK. It may take a while to complete! If you are still having problems, check the Permissions tab in Properties. You may need to give your account permission to the folders. Thank you! Thank you! Thank you! I was going around in circles with all help topics telling me to run the repair tool, when I just needed to find my stolen files! You helped me fix it and now I have a functioning Outlook. Damned Windows 10. My computer don't have a windows.old ? Is there any other way? That means the folder was deleted (its only kept for 30 days). If you don't have a backup file, then no, there is no way to recover missing data files. Sorry. I have tried to open in safe mode yet it is trying to contact exchange server, which I had never configured. Please help. what type of email accounts are configured in outlook? What is the default data file? Can you open the Control panel, mail applet? My Outlook 2013 program on my pc has stopped working. A pop up note says that a problem caused the program to stop working correctly. Windows will close the program and notifiy you if a solution is available. I then close program and nothing happened! It only works when I go through the internet and it works on my other devices e.g. Ipad, mobile but not on the PC. Any idea what I should do please? does it work if you start in Safe mode? My computer was already running Win10 and we had major upgrades yesterday and this morning my IT dept had to fix some issues. I save ALL of my working files, including .pst files on a server, not my hard drive. However, when they returned my computer to me, 2 months worth of emails and even contacts are gone. When I go to the .pst location on my server, it looks like some of the pst files are missing entirely. For example. I have a .pst file titled: AAA_Projects about 2 months of this emails and subfolders created within the last 2 months are gone. I have another .pst file titled: Accounts A, which was a new file I created within the last 2 months. The entire folder and subfolders are gone. I tried to walk through your steps above with IT (C:Windows.oldUsersusernameAppDataLocalMicrosoftOutlook) and when I get to the folder "Windows.old" my name is not among the users. So, I couldn't go any further. My IT department is stumped and so am I. I'm not giving up, I know those files are somewhere. Everything was fine yesterday (except for other computer issues - computer blacking out).